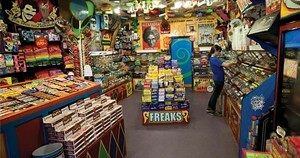 Editor's note: With its latest Best Place To Satisfy A Sweet Tooth win in 2013, Freak Lunchbox, Halifax was elevated to the Best of Halifax Hall of Fame. When Jeremy Smith and his now-wife Erin first showed up in Halifax, they didn't know a soul. Finding it hard to get ahead in Toronto, the recent college grads left the city—and Smith's sign-painting business—knowing they'd love to be near the ocean and they wanted to start something of their own. Lucky for us, without a single connection or much knowledge of the city, in 2001 the pair leapt, and the net appeared. The popular nut carts that line the streets of Manhattan—and their fun, novel, repeat-customer draw—were the Smiths' original inspiration, but back in Toronto they'd vetoed the food cart biz. "We wanted something that people would repeatedly come to, throw a toonie down and not even think about," says Jeremy, taking a break from unloading 400 cases of Vanilla Coke. With the aim of creating jobs for themselves, the pair worked overtime—waiting tables at night, writing a business plan during the day—and within 10 months of making the move, Barrington Street's most colourful beacon, Freak Lunchbox, was born. And so was the beginning of a candy empire that now shines bright in five provinces. "When we opened we had sawdust in our hair," says Jeremy. Without hiring contractors, he and Erin constructed and designed the entire downtown storefront, which was, and remains, unlike any other shop in town. "We literally had to push the door open the minute we turned the saw off because things were that tight." They'd been living a sweet tooth's dream with an atticful of candy for three weeks before settling on the lease at 1723 Barrington Street. "I don't think we ate anything else," he says, laughing. "It was pretty gross." Jeremy and Erin ran the edgy, kooky, circus-sideshow-themed shop from 9am until 1am for its first year, doing paperwork in the wee hours of the morning. "It was difficult but it was exhilarating at the same time, because the reaction when we first opened was immediate." The iconic flagship store's been evolving consistently since then, stopping passerby with attractive hand-painted signage and stocking up on hilarious toys, strangely-scented air fresheners and quadruple-thick milkshakes. 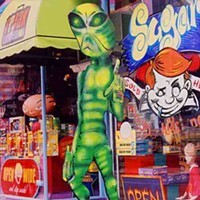 And Jeremy says that 12 years later, Freak still has first-timers and loyal customers alike saying, "wow." 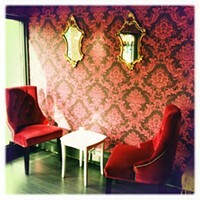 Though the duo tried its hard-working hands at the women's clothing scene with Peepshow Girly Boutique—which neighboured Freak Lunchbox on Barrington for five years, closing in 2009—the Smiths have stayed true to the sweet stuff in their business ventures. They took the sideshow on the road in 2005 when they opened the second Lunchbox in Bedford's Sunnyside Mall, and since then they've Freaked out Saint John, Montreal, St. John's and Calgary. "You always think of the risk, but the potential and the excitement always outweigh the risk," says Jeremy of the pair's chance-taking ways. "I think our nature is to not stop working. We enjoy it, we like challenges. Essentially its just adding every day to what you've got. Now we've got a chain of six stores across Canada." 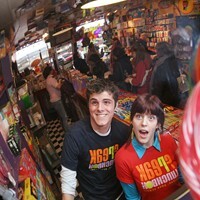 It's that unwavering excitement from both the shop's owners that keeps people craving another taste. 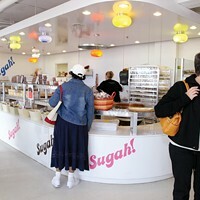 Sure, Freak Lunchbox may not be your dentist's favourite shop, but handily winning the Best Place To Satisfy A Sweet Tooth category in our readers' poll for the past five years proves that raging sugar highs bring the masses to the polls (take note HRM). "We love our job and we love that people have appreciated it since day one," says Jeremy. "That's why we keep doing what we do, it's because people come in and they say thank you. It's a really great feeling."